Original franked letter strapped to a gunpowder rocket and fired over a mountain range in the Eastern Himalayas in 1935? Oh yes. 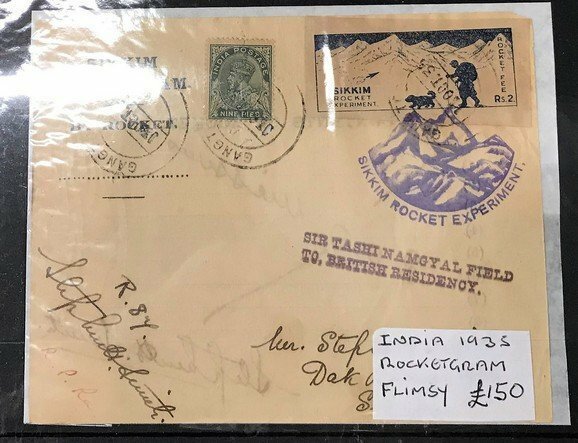 This remarkable relic of postage history was the brainchild of one Stephen Hector Taylor-Smith, an Indian aerospace engineer who was officially authorised by the king of Sikkim to pioneer mail delivery by rocket. Although the experiment worked, this was a short-lived method (as a few of the rockets exploded, incinerating the ‘rocketgrams’) so examples like this are much sought after. The only ordinary thing about this is where you might find it…. Charing Cross Market – the usual place for discerning collectors. Every Saturday 7am – 3pm. Leave a Comment on Rocketmail! Read the words of one of 601 Squadron’s front line pilots as he describes his latest sortie over Central London on 26 July 1940. This is one of a pair of actual written reports on enagagements with the Luftwaffe during the Battle of Britain. It’s not every day that you get to see items of such genuine rarity and historical significance. It’s just Saturdays. Between 7am and 3pm. At Charing Cross Market.